Friday, March 23, 2018 ~ 11:00 a.m.
Judith Lyn “Judi” (Parker) Schamp, 75 of Ashland, NE, died Sunday, March 18, 2018 at the Oxbow Living Center in Ashland. She was born September 15, 1942 in Ashland, NE to Harold Lyn & Opal G. (Root) Parker. She had one brother, Dennis Keith, who died in infancy. Her father, Lyn, was killed in Belgium in 1944 while fighting during World War II. Judi’s mother then married Clarence Schnake and he became her much loved Dad. 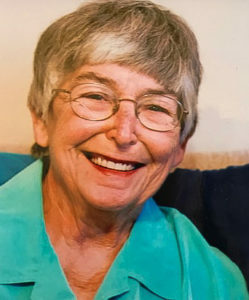 She grew up in Ashland and graduated from Ashland High School in 1960. On September 17, 1960, she was married to Clarence Schamp in Ashland. During their 57 years of marriage they lived in Stockton, MO and Riverton NE, returning to Ashland in 1984. Judi spent her entire career working in the medical field. She worked as a hospital administrator in Red Cloud, NE and as a medical records specialist at both Lincoln General Hospital and Tabitha Health Services in Lincoln where she retired from in 2005. Judi also managed Schamp Auction Service, a business she ran with her husband Clarence. She was an active Gold Star member of the Ashland American Legion Auxiliary and was a founding member of the Ashland Cemetery Directory, a group responsible for the establishment of the cemetery directory, repair and replacement of damaged grave markers and the marking and naming of cemetery streets and planting of trees. She is survived by her husband, Clarence Schamp; children, Rusty Schamp, Kristi (Brian) Smith, Andy (Kellie) Schamp; grandchildren, Brian, Tarah and Kyle Schamp, Logan (Shannon) Luetkenhaus, Kate (Michael) Becker, Amy (Mike Schwab) Smith, Caroline Smith, Brody (Alysha) McLean, Alysha Schamp, Brock Schamp; great-grandchildren, Addisyn, Peyton, Dillion, Kennedy, Monte, Rorie, Josie, Brooke, Nyah, Braydon, and Gina. She was preceded in death by her son, Michael John Schamp; parents, H. Lyn Parker and Opal and Clarence Schnake; brother, Dennis Keith Parker. Sorry for your loss, Judi was a great lady! Prayers & positive thoughts to all. We are thinking of you all today: Specials Hugs Love and Prayers for Stephanie and her family!! Love your residents and fellow staff members at Broken Bow Care and Rehab!!! Sorry for your loss. We think about you all and the memories we had when we all lived in Riverton. Our thoughts and prayers are with you all. Rusty, so sorry to hear about Judy, just heard about it today in church. So sorry.